D3Publisher have today confirmed that they are to release Angler’s Club: Ultimate Bass Fishing 3D for the Nintendo 3DS this summer across Europe and the EMEA region. fishing spot any time of day, or may even join their very own Angler’s Club to compete in over 50 championship tournaments in visually stunning 3D. Utilising the all-new analog stick controls and accelerometer that are incorporated within the Nintendo 3DS system, the game is set to make finding and hooking fish the most authentic and natural experience on a handheld system. 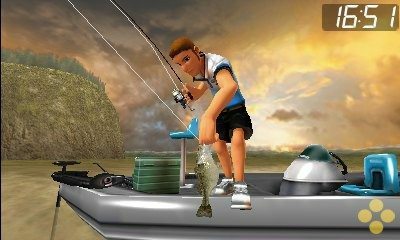 Angler’s Club: Ultimate Bass Fishing 3D is due to release in Summer for Nintendo 3DS, across Europe and the EMEA region.